“Viva South America!” proclaims Outside Magazine writer Patrick Symmes as he describes some of the best and most unique things to do and places to stay on this vibrant continent. 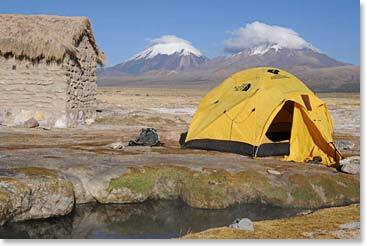 Included in his list, and at the top of ours, is the Berg Adventures trip to Bolivia. You’ll get to climb a number of mountains including Pequeño Alpamayo in the Condoriri group and Sajama, the highest mountain in Bolivia at 21,486ft/6,549m. The hiking, climbing and camping are all fantastically beautiful and feature wide-open plains, crystal clear alpine lakes, dramatic peaks and wild llamas. Aside from the awesome climbing and hiking, other exciting trip highlights include sightseeing in the world’s highest capital city, La Paz, two nights to acclimatize and explore the shores of Lake Titicaca, a day trip to the Incan ruins on Isla del Sol and a relaxing soak in the natural hot springs below Sajama to finish off the trip. We still have a few spaces on our June 2011 trip, so don’t miss your chance to sign-up! If you can’t make it this year, the 2012 and 2013 trips are open for registration. 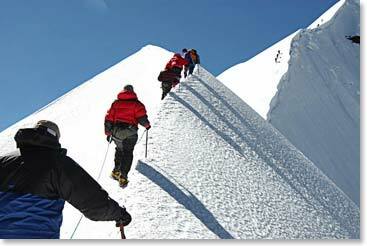 You don’t have any mountaineering experience, but you want to go climbing in Bolivia? Stay tuned, because we are putting together our first ever Mountaineering School Program in Bolivia for summer 2012. If you’re interested, contact us! For more information on the Berg Adventures Bolivia Trip, please go to our Bolivia trip description page. To read about our past Bolivian adventures, check out the dispatches. To register, give us a call or fax/email us your application forms found here.